I’m back, I survived the weekend and things went really well. For one, I finished my 5K in under 30 minutes (which was my lofty goal after feeling so miserable last time), and secondly, I didn’t get sick! I call that success!! We had a great time. Now, for whatever reason – my body has been in decompression mode following the traveling this month and I have been so tired that tired doesn’t even describe it today. I took a 2 hour nap and could have slept into the night. Tonight – it’s lights out EARLY! So what did we do for food on our trip? Well I wanted to share with you my exciting little treat I started making. I used to always make banana pancakes for traveling, because they’re easy and have some protein when I can’t have warm eggs. But honestly, they didn’t pack the best and were sort of mushy by the time I got to eat them. Last week, a fellow celiac (who is so similar to me, I almost wonder if we’re sisters!) had posted her idea for making Belgium waffles a week or more ago, and I tried it out one night to surprise our son. Well, low and behold – I realized it was something I could safely eat – so I ate one immediately following while it was warm… with syrup. Mmmmmmm It was calling my name. (That’s a no-no, the syrup….my mouth sore reminded me the following day) Naughty Sara. So here they are – and yes, they are Auto Immune Protocol safe. Who doesn’t LOVE warm waffles? That’s right – now GO… get some!! Put into blender for 30 seconds, or until well blended. Grease waffle iron with organic coconut oil or organic old pressed organic olive oil and pour onto waffle maker. I often go through a bit of a depression after I come back from Iowa…longing for things and people of home, feeling disconnected with people who have lived here forever. It’s hard living away from family, and missing that connection of my youth. This year was no different. The first week back, I had a pity party of sorts. I cried in Bible study. I cried to my husband. I just miss Iowa. I was sorrowful that I had given up my family, and friends – and that life being different feels SO unfamiliar here sometimes. Posted on August 28, 2013, in Auto Immune Disease, Celiac/Gluten Sensitivity, Food To Try and tagged auto immune disease protocol diet, celiac disease, gluten intolerance, gluten-free waffles, grain-free waffles, healthy for him, large family Paleo, MS, waffles paleo. Bookmark the permalink. 8 Comments. Oh my. Your last comments sound just like me! I miss my family and friends in Illinois so much, the people who, as you said, ‘get me’ and know me and love me. I feel so lonely also but have come to the same conclusion, that God has me here for a season of being lonely enough to seek Him even more. I am learning (not I have learned, like Paul), to be content, a work in progress. But I cannot wait to return home to the familiar. I still have up to 2 1/2 years to go….. I am hoping that I get better at not waffling on the contentment too! :). And I don’t have a waffle maker here with me, do you think is recipe would do good for pancakes? ((Hugs)). It’s tough stuff isn’t it? God never promised easy. Someone else mentioned that we get “honeymoon” ideas when we visit because we have things planned for a short time, but that if we lived there it would be more mundane. I’m sure that’s partly true also. I definitely think the recipe would work as pancakes. I would maybe just add a smudge of water or coconut milk. I am wondring if we could not make your waffle recipe & freeze them for RV travels– & warm them in a skillet– I wonder if they would freeze well— I don’t know why not– think I will try it!!! 🙂 Thanks Sara— as always– thanks for the great things you share!! I would think they would freeze well and be great just thawed or warmed in the skillet. That is so true. I liked being called “so and so’s little sister” and by my maiden name… Even if for just a weekend. 🙂 it warmed my heart. What is a traveling cup size of applesauce? Sounds interesting. Thanks for sharing. I would say each one is a half cup of applesauce, so a cup total. They are in those 6-8 packs of organic applesauce. Made these today. The batter is very thick. My blender couldn’t handle it. I’ll use my mixer next time. 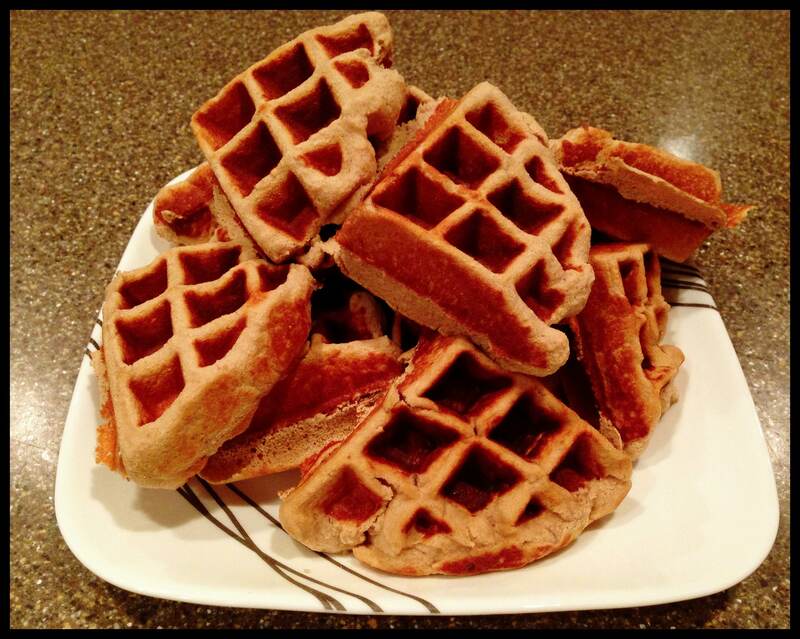 They are good, but hard to spread in the waffle iron since they are so thick. Harder to make them complete circles, but otherwise looks just like the picture. Susannah took one bite and said “tastes like banana bread.” Lol… I hadn’t told her the name. Got 5 waffles. I think it would be awesome topped with whipped coconut cream and fruit. I’ll try that next time. Thanks!